Every year I make calendars with my kids' pictures and give them as Christmas gifts to parents and grandparents (and myself). But I don't like using pre-created calendar templates. Because I'm kind of snobbishly picky. Plus, I like making my own. Basically, all the months come as an 11x8.5" png file with "holes" to fill in with all your photos. So you'll need a photo editing and/or digital scrapbook program that will allow you to put your photos behind the template to fill the "holes". Once you have your photos placed you can print these at home, or upload them to your favorite calendar printing service (such as: Shutterfly, Winkflash, Walmart, Snapfish, ect. - - I personally use Vistaprint, because they are cheaper than everywhere else). This calendar template is free, FOR YOU. Because you're awesome. And I like you. But they took awhile to make, and also the file is super really big and Google doesn't like it when you attach super really big files to blog posts, so you'll have to go pick these up at my website, Green Jello with Carrots, with a coupon code. 1- Go to my site and put the Create You Own Calendar Template in your shopping cart. 2- You'll have to create an account and sign all the way in (our cart is super picky about letting you use codes if you're not signed ALL THE WAY in - it's a little obnoxious, but that's just the way it is). 3- Enter the code: POPPYSEEDS to get the full price of the calendar template discounted from your cart. 4- Feel free to also fill your cart with lots and lots of other printable products (but you'll have to pay for them). 5- Check out. Then you will be emailed instructions on how to download (it's easy, don't worry). 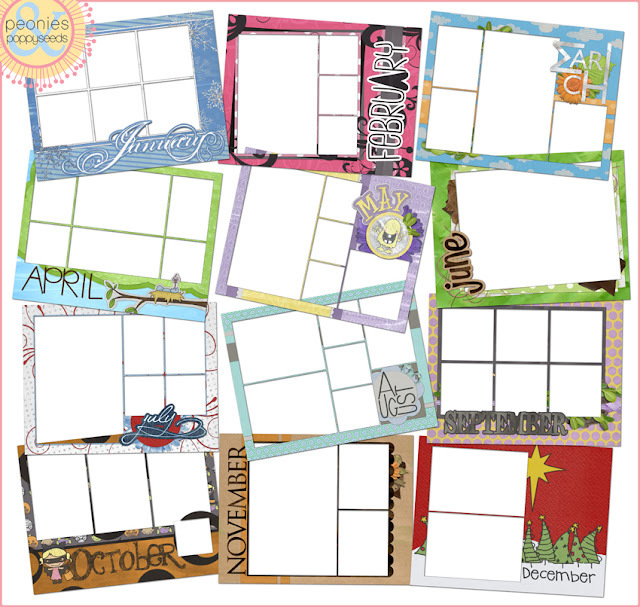 And there you go - you're very own FREE (for you) Calendar Template! Follow us on: Bloglovin’, Twitter, Become a Facebook Fan and keep-up via Networked Blogs!